Transmissible cancers are incredibly rare in nature, yet have arisen in Tasmanian devils on at least two separate occasions. New research from the University of Cambridge identifies key anti-cancer drugs which could be trialled as a treatment for these diseases, which are threatening Tasmanian devils with extinction. The research also found that the two Tasmanian devil transmissible cancers are very similar to each other, and likely both arose due to susceptibilities inherent to the devils themselves. Tasmanian devils are marsupial carnivores endemic to the Australian island of Tasmania. The species is considered endangered due to devil facial tumour 1 (DFT1), a cancer that is passed between animals through the transfer of living cancer cells when the animals bite each other. DFT1 causes grotesque and disfiguring facial tumours, which usually kill affected individuals. The DFT1 cancer first arose in a single individual devil several decades ago, but rather than dying together with this devil, the cancer survived by 'metastasising' into different devils. Therefore, the DNA of the devils' tumour cells is not their own DNA, but rather belongs to the individual devil that first gave rise to DFT1 all those years ago. Remarkably, DFT1 cells can escape the devils' immune systems despite being in essence a foreign body. 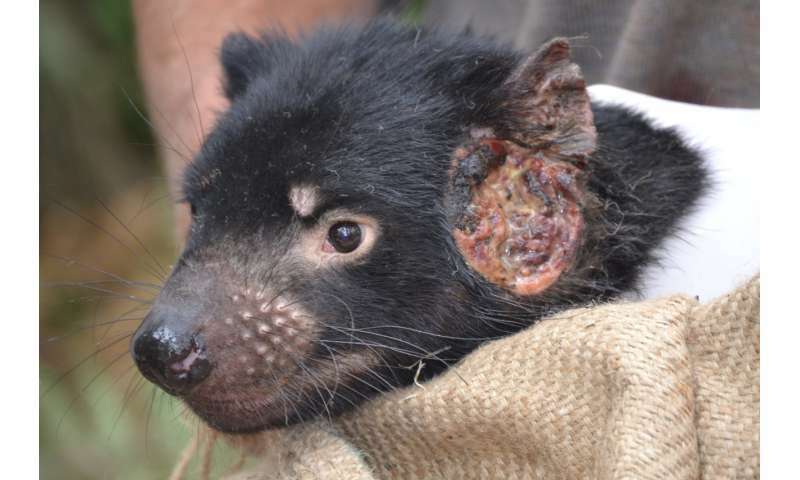 The DFT1 cancer was first observed in north-east Tasmania in 1996, but has subsequently spread widely throughout the island, causing significant declines in devil populations. In 2014, routine diagnostic screening revealed a second transmissible cancer in Tasmanian devils, devil facial tumour 2 (DFT2), which causes facial tumours indistinguishable to the naked eye from those caused by DFT1, and which is probably also spread by biting. However, analysis showed that the two types of cancer differ at a biological level, and whereas DFT1 first arose from the cells of a female devil, DFT2 appears to have first arisen from a male animal. For now, DFT2 appears to be confined to a peninsula in Tasmania's south-east. "The discovery of a second transmissible cancer in Tasmanian devils was a huge surprise," says Dr Elizabeth Murchison from the Department of Veterinary Medicine at the University of Cambridge. "Other than these two cancers, we know of only one other naturally occurring transmissible cancer in mammals—the canine transmissible venereal tumour in dogs, which first emerged several thousand years ago." In fact, outside of mammals, only five transmissible cancers have been observed, all of which cause leukaemia-like diseases in clams and other shellfish. "The scarcity of transmissible cancers suggests that such diseases emerge rarely," she adds. "Before 1996, no one had observed them in Tasmanian devils, so finding two transmissible cancers in Tasmanian devils in just eighteen years was very surprising." In order to see whether the devil transmissible cancers are caused by external factors or whether the animals were just particularly susceptible to developing these cancers, a research team led by Dr Murchison analysed the genetic profiles of DFT1 and DFT2 tumours taken from a number of Tasmanian devils. The results are published today in the journal Cancer Cell. The team found striking similarities in tissues-of-origin, genetics, how the cancer cells mutate, and possible drug targets. This implies that the two tumours belong to the same cancer type and arose via similar mechanisms. The team studied the genetic and physical features of the tumours, and compared the two lineages with each other and with human cancers. In doing so, they identified an important role in the tumours for particular types of molecules known as receptor tyrosine kinases (RTKs) in sustaining growth and survival of DFT cancers. Importantly, drugs targeting RTKs have already been developed for human cancer, and the researchers showed that these drugs efficiently stopped the growth of devil cancer cells growing in the lab. This leads to hope that it may be possible to use these drugs to help Tasmanian devils. 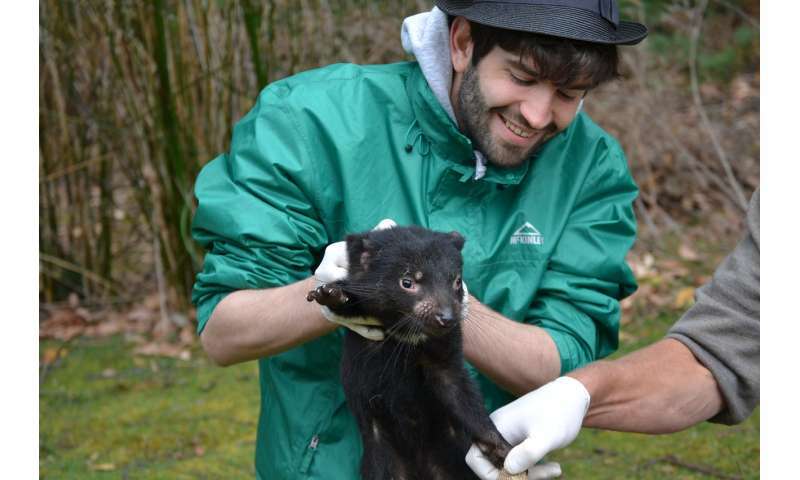 First author of the study, Maximilian Stammnitz, adds: "Altogether, our findings suggest that transmissible cancers may arise naturally in Tasmanian devils. We found no DNA-level evidence of these cancers being caused by external factors or infectious agents such as viruses. It seems plausible that similar transmissible cancers may have occurred in the past, but escaped detection, perhaps because they remained in localised populations, or because they existed prior to the arrival of Europeans in Tasmania in the nineteenth century." Why Tasmanian devils should be particularly susceptible to the emergence of DFTs is not clear. However, devils bite each other frequently around the facial area, often causing significant tissue injury. Given the important role for RTK molecules in wound healing, the researchers speculate that DFT cancers may arise from errors in the maintenance of proliferative cells involved in tissue repair after injury. "When fighting, Tasmanian devils often bite their opponent's face, which may predispose these animals to the emergence of this particular type of cancer via tissue injury," adds Stammnitz. "As biting occurs on the face, this would simultaneously provide a route of cell transmission." The researchers say it is also possible that human activities may have indirectly increased the risk of the emergence or spread of transmissible devil facial tumours (DFTs) in recent years. For instance, it is possible that some modern land use practices may have provided favourable conditions for devils, leading to an increase in local population densities of devils, and to greater competition, interactions and fights between animals, which may in turn have raised probabilities of DFTs arising or spreading. Alternatively, early persecution of devils by European colonists may have additionally contributed to this species' documented low genetic diversity, a possible risk factor for disease spread and the ability of DFTs to escape the immune system. The researchers also identified deletions in DFT1 and in DFT2 in genes involved in recognition of cancer cells by the immune system. This may help explain how these cancers escape the immune system. "The story of Tasmanian devils in recent years has been a very concerning one," says Dr Murchison. "This study gives us optimism that anti-cancer drugs that are already in use in humans may offer a chance to assist with conservation efforts for this iconic animal." They are talking about drugs such as Imatinib, sold under the brand names Gleevec. In the United States a typical human dose for a year has a wholesale cost of $84,408.78,while in the United Kingdom the NHS was paying about 20,980 pounds ($28,327) in 2016.